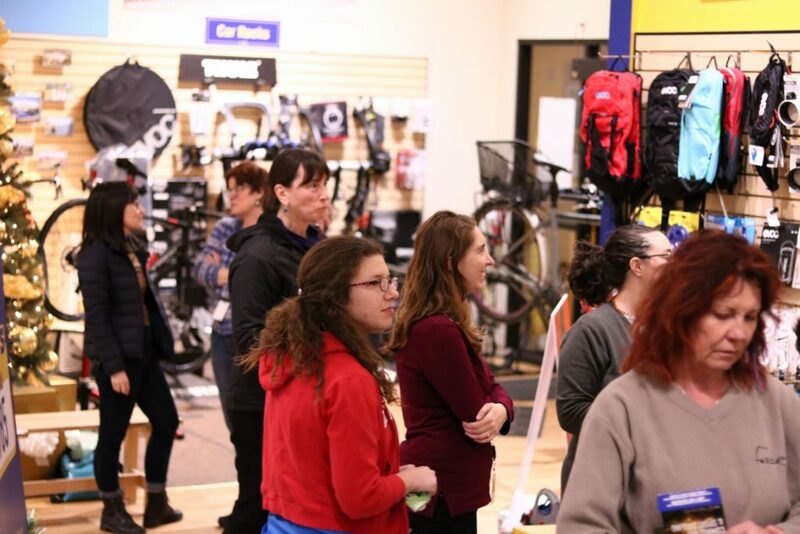 Now that the snow’s here, we thought we’d pass on the tips shared at our Winter Cycling Clinic for Women & Non-binary Folks. Thanks to CycleWR chair Emily Slofstra, volunteers Kate Dudek and Gwen Mitchell, Ziggy’s staff, and our attendees for all the great advice! 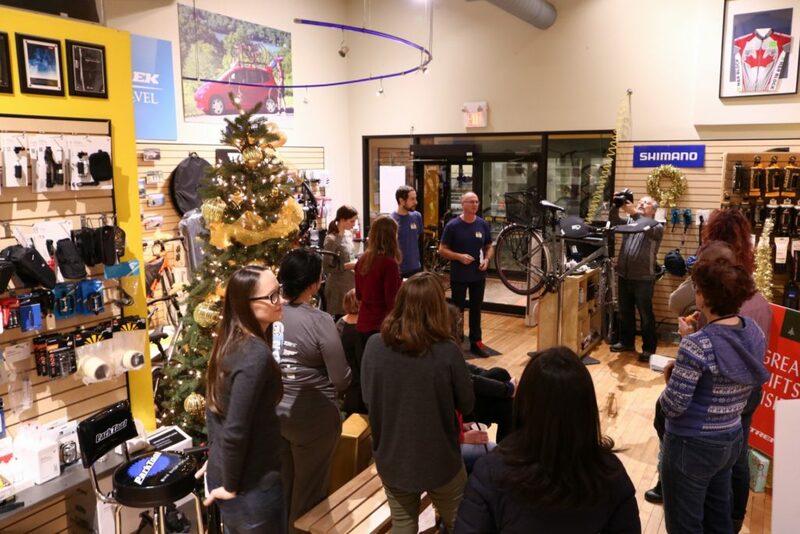 And a huge thank you to Ziggy’s Cycle & Sport for hosting, taking photos, and sharing winter bike maintenance tips! Photos by Steve Schwarz. Layers, including a wool base layer, but not too many: start out feeling a bit cold so you don’t overheat. Not cotton: Cotton gets cold when it gets wet and you don’t want that in the winter! Bright colours, maybe even a reflective safety vest. Visibility is reduced in the winter so take extra steps to make sure you can be seen. Crampons on one or both feet, for extra grip when stopping. Good, insulated boots to keep your feet warm and dry. Size up to fit an extra pair of socks. Tuck your pants and laces in, away from your chain. Ear coverage: Try a helmet with a snap-in winter liner, a Buff* folded into a headband, or a skullcap that’s snug around your ears. Lobster mitts or pogies: Three-finger gloves (a.k.a. “lobster mitts”) trap more body heat than regular gloves but still allow you to change gears easily. Pogies are like essentially mittens that cover your handle bars, including the brake and shift levers. 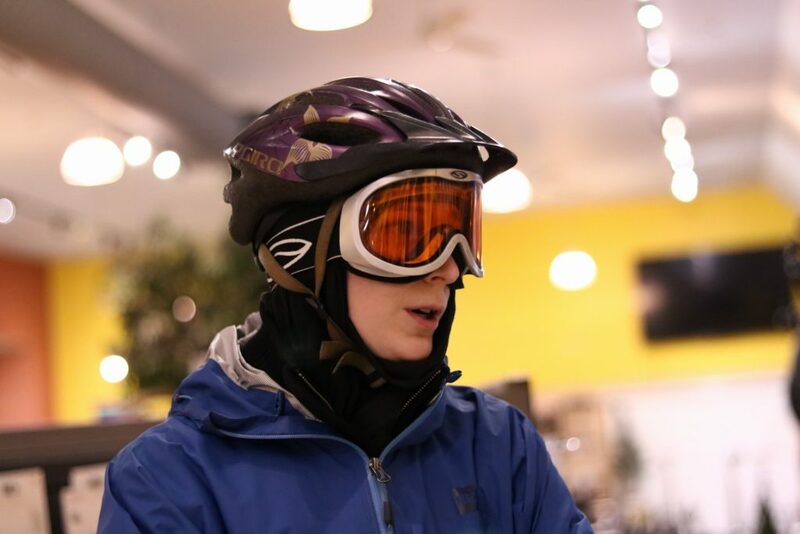 Goggles and a balaclava or Buff* to cover your face. A Buff provides more flexibility: You can lift it easily to cover your nose and mouth but lower it again when you inevitably get too hot. If it’s particularly snowy or slushy, rock some snow pants to stay dry. *A Buff is essentially a long tube of fabric that you can wear a whole bunch of different ways. Buff is the most common brand of these, but there are others. A small spray can of WD40, in case your lock freezes. A change of clothes if your cycling layers aren’t the look you’re going for or you tend to get sweaty. Spare socks: Unless you’re wearing wool, your socks are likely to get and stay damp. A stash of toe/ hand warmers in your boots, mitts, or pockets. Let a little air out of the tires; this gives you better grip on the road. Lower your seat when it’s icy so you can easily touch the ground when stopping. Switch out your regular tires for studded or mud tires. Studded tires obviously add extra grip on ice and slick snow. Mud tires have wider lugs so snow doesn’t get trapped as easily. Get a stainless steel chain or (or plan to replace your chain in the spring). 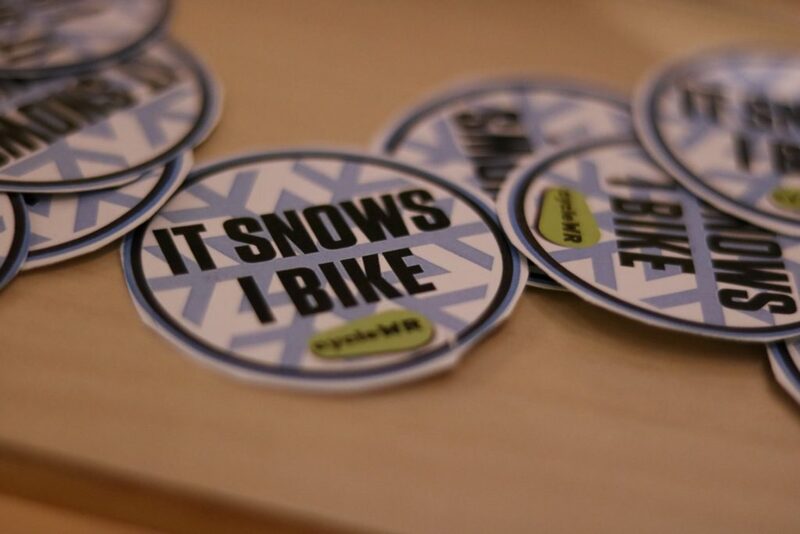 If you can, get a dedicated winter bike if you’re riding it regularly throughout the season. 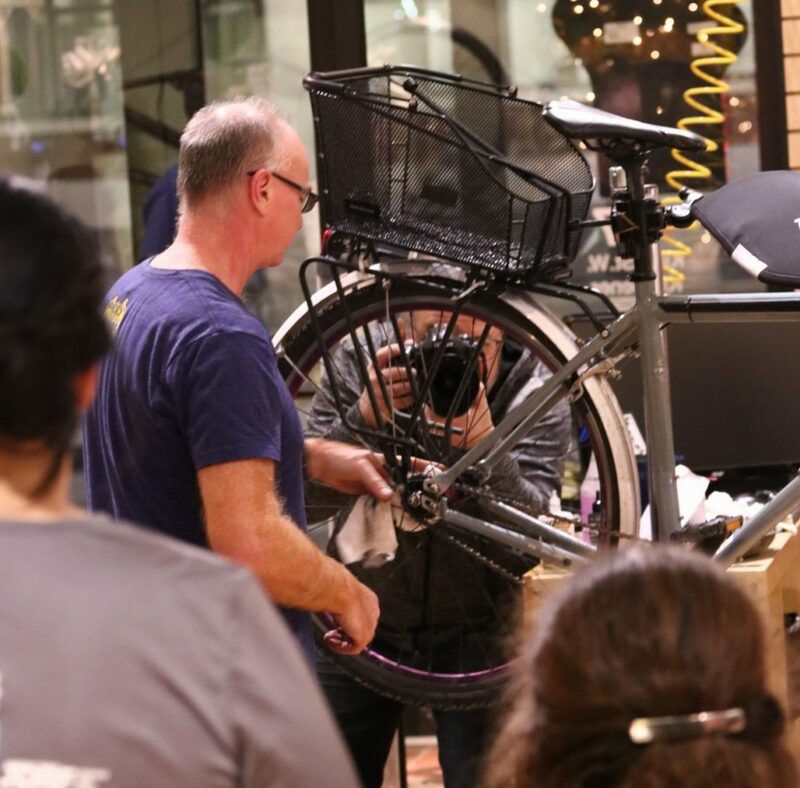 A single-speed means fewer parts to get damaged by all the salt and slush. Clean it frequently. Salt is really hard on your bike! Clean your chain with a rag after every ride, then add lube. Wipe the rest of your bike down regularly with dish soap and water, then wipe it dry. Try not to get cleaning solution on your rims—use rubbing alcohol there instead. Tip: Old cotton shirts don’t leave fibres in your chain. To clean your bike easily without a bike stand: Flip it over and prop the handles on something (e.g. yoga blocks) to raise them off the floor. Get off and walk when you need to. Encourage drivers to pay extra attention: Kate finds that cars behave better when she’s wearing a Go-Pro on her helmet. The Charles & Benton, City Hall, and Kitchener Public Library parking garages have secure, covered bike parking. They require a $10 deposit for an access card. You can leave your bike at Ziggy’s during store hours!